Sadly, this loading screen is one of the better looking parts of the game. So can NCII fall back on its other merits if the enemies are a chore to fight? Unfortunately, it can't. If you ignore the combat, NCII could be billed as an exploration or horror game, but it fails to satisfy on both counts. While you do visit some interesting locales, you never really feel like you're exploring because of the extreme linearity of the maps. If you have a choice of paths, generally one will yield a barricade almost immediately, and the solution to getting through, whether it be a locked gate or switch activated door, will be found down the other path. The puzzles range from obvious (find key, open lock) to unclear (find random hunks of metal and assemble them to make a drawbridge lever). Kalisto offers you no freedom at all -- you must jump through every hoop they present. Smashable doors will be mysteriously un-smashable, and open corridors will have annoying invisible walls blocking your path if you don't kill every last enemy in your immediate area. I'm guessing this is how they compensate for the poor enemy AI -- without these conceits, you could just run right past the slower monsters. 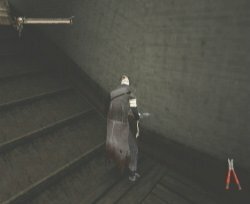 They're helpless to follow, since most are unable to leave the room they spawn in. Moving on to the notion of horror, sometimes a good scare is all that a gamer needs to embrace a title (even at the expense of replay value). Here again, NCII falls flat... Wallace can aimlessly roam the mean street of London without consequence, until of course the camera angle changes and an enemy health meter appears. As a result, nothing is surprising, much less shocking. If an enemy is near, you'll know it when your view switches to the battle mode. While this may prevent most obvious camera difficulties, it negates all feelings of terror and apprehension that might normally aid a title like this. Also, as mentioned earlier, poor AI ensures that you'll never have to fear being chased or stalked. You know you're playing a bad game when they can't even bother to model individual steps, using a texture on a sloped surface instead. The graphics engine is fairly solid but still riddled with minor bugs that should have been cleaned up. Some entities disappear when you look at them from a certain angle, others share a particularly eye-catching texture error, and yet another object randomly toggles its visibility when viewed from a distance (specifically, the drawbridge at the end of Crowley's castle). Also, whenever Wallace or a monster gets knocked to the ground, their model is partially consumed by the floor. The textures are extremely low-res, and the models terribly under detailed. In other words, they're fresh from the Playstation version. Worse, the framerate takes dip every now and again, even when Wallace stands alone in a large room. A combination of WinCE and shoddy programming is to blame, no doubt. On a subjective note, I found the game to be entirely too dark. The fog line (the division between the darkness and the dimly lit region surrounding the camera) is closer than that of an N64 game, so exploring large rooms requires several passes. Often you are left alone on the black screen with nothing but the glow of Wallace's bandages to keep you company. As noted earlier, the sound effects are very weak. The voice acting is about right for games these days, which is to say horribly mismatched. They must believe that anyone with a British accent can pass for the voice of a depraved, ax wielding maniac. The music however is a bit more subjective... If you're a fan of Rob Zombie, you're in luck. The Astrocreep himself contributes nine tracks to the game, but if you're anything like I am, he is just another annoying zombie. However, these songs only play during the cut scenes, leaving silence or near inaudible, ambient "music" during gameplay, adding nothing to the in-game atmosphere. Finally, NCII is prone to crashing... more so than any other game in my experience. Just leave the demo loop running for a while; the cd spin down is terminal, requiring a power off. Twice the game hardlocked on me in-game, and twice more it showed similar symptoms, but managed not to crash. Yet another time, a serious crash (while trying to soft-reboot), brought me to a debug screen with memory stats and a CPU exception -- this is something I have never seen in all my years of console gaming. It might be a good time to reiterate that the game utilizes Windows CE... draw your own conclusions. 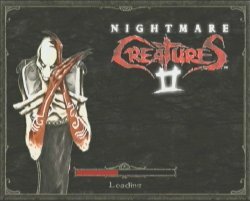 Nightmare Creatures II is a rough sketch of a game that never quite reaches maturity. It has its winning qualities, but the many under-developed and unpolished facets draw your attention far, far away. NCII also fails in the technical arena, completely neglecting to take advantage of the Dreamcast's capabilities. As such, I can't recommend this game as anything more than a lesson in how NOT to port a Playstation title to the Dreamcast. Avoid. Highs: Gratuitous gore, demented sense of humor. Other: 1 player, VMU Compatible (29 blocks), VGA-box Compatible, Jump Pack Compatible, Arcade Stick Compatible.